From Left to Right: Blade Runner, Alien, King Kong, The Exorcist. Look, The Shape of Water is great. Seriously, it is. But when you look at film history, the fact that The Shape of Water is the first science fiction film to ever win Best Picture is kind of weird. There have been decades and decades of phenomenal scifi films better than The Shape of Water, so for it to get the award first also feels a little frustrating. Here are some of the movies that earned the Best Picture Oscar—even if they didn’t win it. There aren’t many effects movies from the 1930s that someone can put on now, almost 100 years later, and still be engaged with, but the original King Kong is one of the greatest. The emotional story, the meticulous creature work, the scope of it all, everything comes together in a truly timeless way. Unfortunately, at the time of release, the Academy Awards didn’t think so, and it received zero Oscar nominations. Following that yellow brick road for almost a century. Even in 1939, the Academy acknowledged that The Wizard of Oz was a masterpiece. The movie got six nominations, including Best Picture, but only won statuettes for song and score. It probably would’ve had a better chance if it wasn’t up against Gone With the Wind. Still, The Wizard of Oz remains one of the most beloved films of all time regardless of genre, and would have been a worthy recipient of the biggest honor in movies. Damn, that Kubrick can capture an image. If you’ve seen 2001: A Space Odyssey, you immediately know why it didn’t win the Oscar for Best Picture, no matter how much it obviously deserved it. It’s just way too out there. Stanley Kubrick wasn’t interested in some run-of-the-mill crowdpleaser. He wanted to take the genre of science fiction and push it as far as it could. The resulting film won a 1968 Oscar for Best Visual Effects, as well as nominations for Best Director, Best Screenplay, and Best Art Direction, but not the big one. At least the Academy members knew they had a great film on their hands, even if they weren’t smart enough to recognize it. Happily, 50 years later, most people do acknowledge it as one of the greatest scifi films ever made—and it’s still as breathtaking as ever. Spoilers, it was earth all a long. Many of the best science fiction films take social issues and wrap them in a fantastic package, and that’s exactly what the original Planet of the Apes film did in 1968. Was it a fun movie on the surface? Yes. Did it work on a bunch of levels beyond that? Most definitely. It was also terrifically popular, becoming a staple of not just the time, but in the decades that followed, spawning a full franchise, tons of references, and just being influential across the board. And yet, the film only got two Oscar nominations, for Costume Design and Original Score, though it won a non-competitive award for its groundbreaking makeup. Watch your mouth, possessed lady! Linda Blair was nominated for Best Supporting Actress. William Friedkin’s landmark 1973 horror film won two out of the 10 Oscars it was nominated for: Best Sound, and Best Adapted Screenplay for William Peter Blatty. But Best Picture that year went to The Sting. Nothing against The Sting, which is an American cinematic classic, but to this day, The Exorcist is regarded as one of the finest genre films ever created, with incredible practical effects, amazing performances, and basically masterful filmmaking from top to bottom. The Exorcist got a knock against it because it’s a horror movie, even though it’s really so much more. It’s hard to fine a photo from Star Wars that isn’t used to death. This one isn’t bad. I wanted to put 1980's The Empire Strikes Back on this list because most people believe it to be superior to the original, but 1977's Star Wars was actually nominated for Best Picture. It lost to Annie Hall (which, admittedly, is great) but still managed to win six Oscars from its 10 nominations. Annie Hall only won four. On top of that, it would have been historically perfect for Star Wars—an original film, a massive hit, a phenomenon the movie industry had never encountered before, birthed from the history of so many science fiction films before it—to have been the first science fiction Best Picture, given that it not only changed movies forever, but all of pop culture. Academy voters likely couldn’t bring themselves to give Best Picture to what they thought was a silly scifi adventure for kids, but history has proven them wrong—so, so wrong. Do do do, do dooooooo. Though it came out the same year as Star Wars, Close Encounters didn’t get nominated for Best Picture. It did get nominated for eight awards though, winning Best Cinematography. And like his pal George Lucas’ film, Steven Spielberg’s follow-up to Jaws used science fiction in a way that spoke to a universal audience. It didn’t matter that it was about aliens. It mattered that it was about obsession, family, and other things anyone could relate to. Even if it couldn’t have beaten Star Wars, it’s one of Spielberg’s finest works. Is it better than The Shape of Water? Yes. Yes it is. Few films have everything going for them: a great story, incredible visuals, dynamic characters, edge-of-your-seat tension. But Alien has all of that and more. 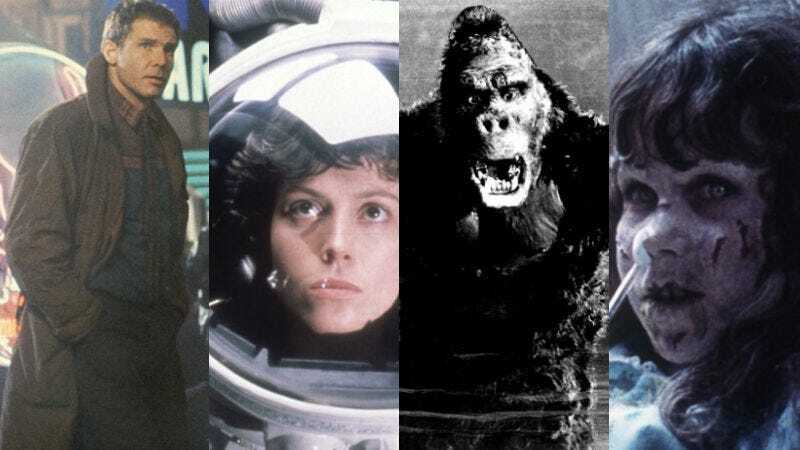 It was a smash hit in 1979 and actually did win an Oscar, for Best Visual Effects, which has traditionally been the only award Academy voters would ever give to scifi movies. “Great movie, cool effects, it’s no Kramer vs. Kramer.” Who watches Kramer vs. Kramer (which won Best Picture the year Alien was released) anymore? It’s a classic movie, but it’s not one you tend to toss in your DVD player on movie night. And yet Alien was so good, it is still spawning sequels and imitators today. Two Ridley Scott movies in a row. But how many filmmakers have presented two such radically different takes on the same genre, back to back even, as Scott did with Alien and Blade Runner? Blade Runner is up there with Metropolis in terms of visually influential science fiction movies, and its themes and narrative are still debated decades after release. No, it wasn’t a big hit, and it was only nominated for two technical Oscars, but what it lacked in box-office receipts or accolades it made up for in cultural impact. It’s recognized today as the masterpiece it is, scifi or otherwise. I think we all need to make a date and rewatch this movie. Winner of the Academy Award for Best Original Screenplay, and nothing else, 2004's Eternal Sunshine was also underappreciated in its time. Hell, it still is. The mind-bending premise by Charlie Kaufman, the sumptuous direction by Michel Gondry, the gritty lead performances by Jim Carrey and Kate Winslet, and the soul-crushing/uplifting roller coaster of emotions are all the types of things a Best Picture winner should have. But 14 years ago, it was just too weird to take the top prize. And while too weird is bad news at an awards show, it’s very good for creating a legacy. Don’t be surprised you made the list, Clive. Released in 2006, Alfonso Cuarón’s incredibly intense, bleak vision of the future is one of those movies that was good enough for a few Oscar nominations (three, including Adapted Screenplay) but supposedly not good enough for a shot at the big prize. No matter. Its story of a world without fertility is one of those painfully powerful things some people may not be able to take. And it’s told with cinematography and editing so visceral, you never forget it. Like the other films on this list, this is a film that will live long beyond any award. George Millar’s action epic Mad Max: Fury Road was yet another film that actually had a shot at history. It was nominated for 10 Oscars, including Best Picture, and ended up winning six, more than any other films that year. By all normal Hollywood standards, it probably was the Best Picture that year. In the end, though, the Academy still wasn’t quite ready to bestow a film so fantastic with the top award in Hollywood, no matter how stunning it looked or what an achievement it was, and instead gave it to real-world drama Spotlight. But Fury Road may have been the film that opened the Academy’s eyes to the true potential of scifi—two years later, The Shape of Water finally got the win. But it should have been Max and Furiosa’s. Okay, this is a bit of a cheat. The Academy Awards didn’t exist until 1929 and Fritz Lang’s landmark science fiction film came out in 1927. What’s more, the awards didn’t even acknowledge foreign films until the 1940s, and even then it didn’t give them a standard award until 1956. So, there’s no way Metropolis could ever have won Best Picture. But, when you look at the greatest, most Oscar-worthy science fiction films in history, you need to see its iconic robot standing alongside them.